Noa Noa is a great drink. It's inspired by my favorite cocktail// the Mojito! Use of brown sugar and dark rum gives Noa Noa the Polynesian or "tiki" twist. 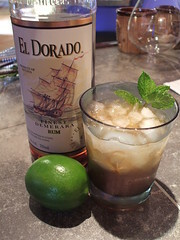 Mojitos are Cuban and use light rum. The standard version uses guarapo or simple syrup instead of brown sugar. The use of brown sugar was apparently something practiced in certain areas of Cuba, however. It helps release the mint oil when muddled and takes less time to prepare than the more typical mojito ingredients. My favorite rums are Havanah Club and Tommy Bahama. Whichever twist you decide to go with, you can't go wrong!